Crowdfunding is a trend that has truly earned its chops lately, with Kickstarter seeing its first two $1m projects emerge within 24 hours last month. But what happens after the money’s raised? TinyLightbulbs is a new online store that has launched to answer that question. From zombie games to photojournalism, all sorts of things have raised money from the public to get off the ground. Supporting these products once their funding round’s closed can be difficult though – how do you find them? 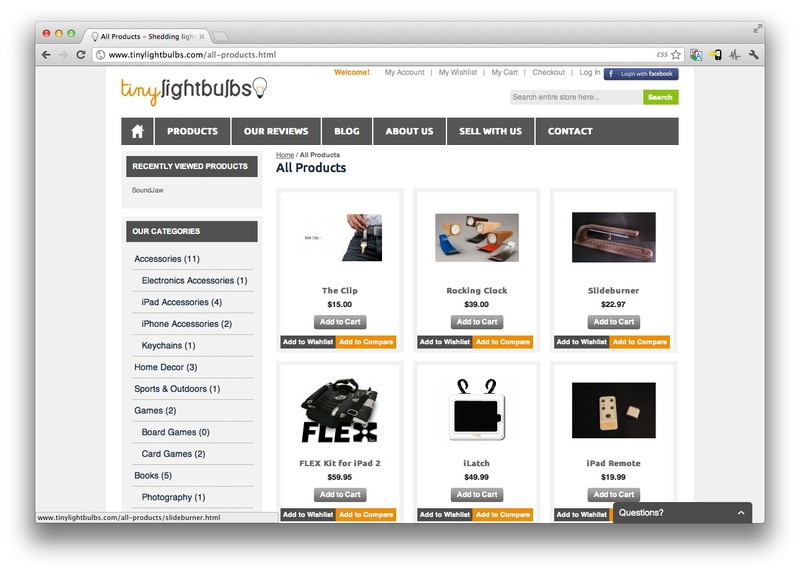 TinyLightbulbs solves that problem by only selling items that were crowdfunded. The site sells a diverse range of products, from Rocking Clocks to iPad Remotes, and Dog Flags to the fashionable 3D glasses we wrote about back in January. Of course, getting people to buy an item just because is was crowdfunded is a harder sell than the funding process itself. After all, people go to Kickstarter and similar sites to do their part in bringing something new to the market. When it’s launched though, does it really need to be singled out as crowdfunded? Whether they do or not, TinyLightbulbs is at the very least a good gallery to promote the variety of products that got their initial push from people-powered finance.